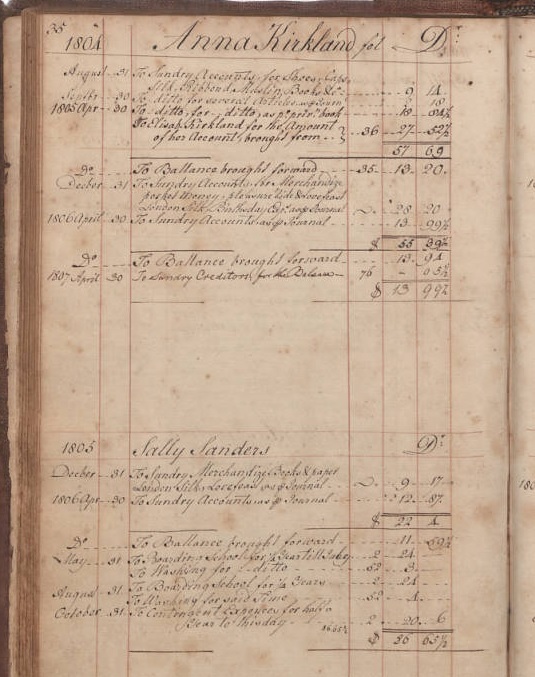 We have recently digitized a ledger from the Boarding School for Female Education from Salem, N.C., covering the years 1805 to 1809. This school would evolve to become Salem College, which houses the ledger today. Inside there are a number of entries concerning the students at the school, as well as a number of businessmen who were involved with the school. One such man is Charles Cist, a printer and publisher in Philadelphia from whom the school bought a number of books for the library. As an all-girls school, the majority of the names inside are women’s names. 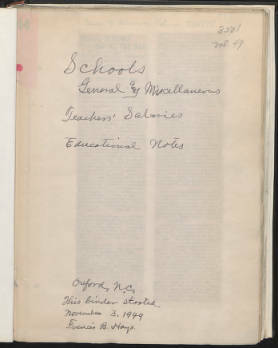 The few men in the ledger appear to be part of the school administration, people whom the school paid for services, or fathers who had paid the school for care of their daughters. 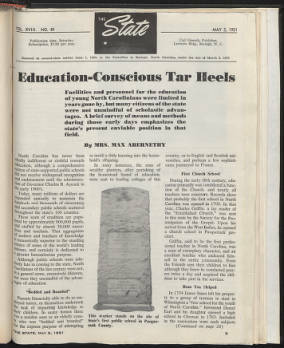 Salem College previously worked with the Digital Heritage Center to share college yearbooks and catalogs going back as far as the 1850s. Volumes 44 through 52 of Mr. Francis B. Hays’s Granville County scrapbooks are now available online. 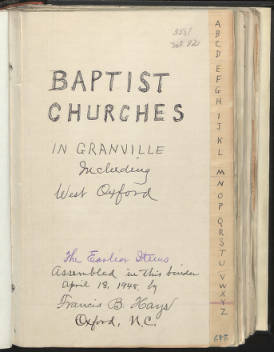 These new volumes contain a number of newspaper articles, histories written by Mr. Hays and others, letters, and event programs concerning various churches and schools in Granville County. The scrapbooks cover a wide variety of topics, from honor roll students to teacher salaries and plans for church buildings, and much more. The scrapbooks are part of the Hays Collection at the Granville County Public Library. Mr. Hays was a local historian and avid collector, as these volumes make clear. He collected materials on a variety of subjects, including schools, churches, marriages, and genealogies. For more materials in this collection as well as more information about Mr. Hays, see the Francis B. Hays Collection on DigitalNC or visit the Granville County Public Library website’s listings of his works. 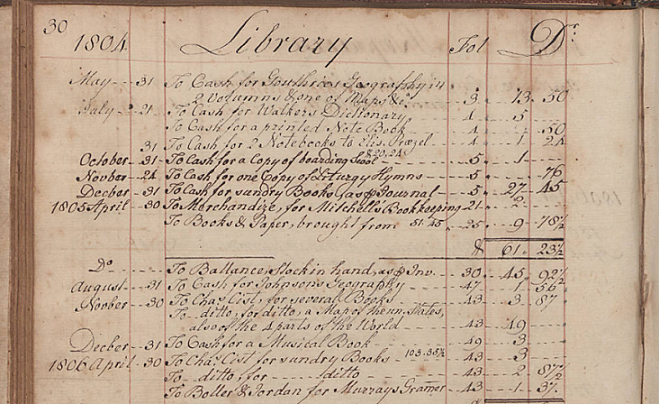 In addition to the Hays material, the Granville County Public Library has supplied a school master’s ledger from 1790. 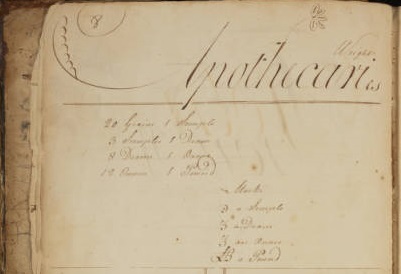 This ledger contains a number of useful tables concerning basic mathematics and measurements. It also contains a number of letters and other documents concerning the Yancey family. New Material now online from the Grand Lodge of North Carolina! DigitalNC has recently added some new materials online from The Grand Lodge of Ancient, Free and Accepted Masons of North Carolina, including meeting proceedings from the years 1866-1890, other types of documents, various physical objects (medals and commemorative jewelry), and large panoramic photographs. One of the photographs shows the members of the Grand Lodge of North Carolina in Washington D.C. with President Calvin Coolidge. The meeting proceedings provide a view into the history of Freemasons in North Carolina, particularly in the Raleigh area. 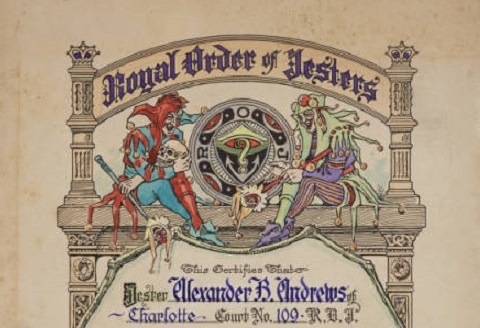 The other documents in this batch include a diploma, a membership certificate and a membership patent from various groups within the Grand Lodge of North Carolina. All of these documents contain delicate script and detailed images full of masonic symbolism. 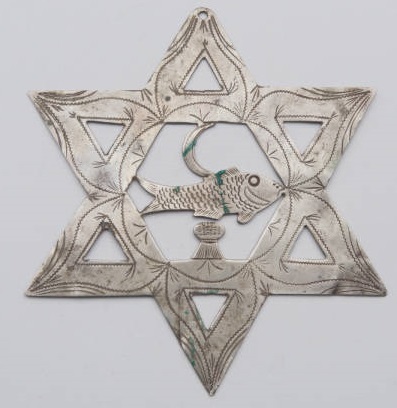 Many of the jewels also contain such symbolism. To see more of the physical objects recently added, take a look at the Grand Lodge’s selection of aprons and badges that have been digitized by DigitalNC. For more information about the Grand Lodge of North Carolina, you can visit their website, or for more on what items have been digitized, see our previous blog post. The Rockingham County Public Library has recently contributed a new batch of materials to the Rockingham County: A Digital Heritage Project digital exhibit on DigitalNC. The emphasis of this batch was on local history. 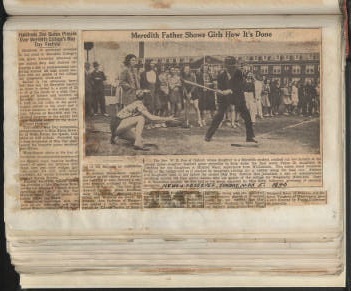 Pictorial histories of Reidsville and Rockingham County generally are joined by self-published booklets by a local historian, a scrapbook of Mayodan people and events from 1909 to 1944, and materials related to church histories from the vertical files. 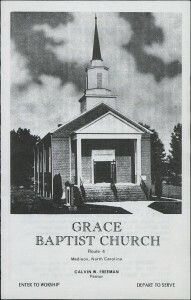 Grace Baptist Church in Mayodan, N.C. celebrated its 57th Anniversary in 1981. A history of the church was published and distributed along with the Sunday Program on August 23, 1981. The vertical files include newspaper clippings, programs, and cemetery surveys to flesh out the history of various local churches in Mayodan, Ellisboro, Reidsville, and Madison. While the vertical files focused primarily on church history, booklets published by John T. Dallas tackled more diverse topics. Dallas compiled fifteen booklets containing archival research, newspaper clippings, registers, and photographs between the years of 2006 and 2012. Seven of these booklets are dedicated to genealogical studies of notable families, while others cover topics such as murder, gambling, and confederate history. 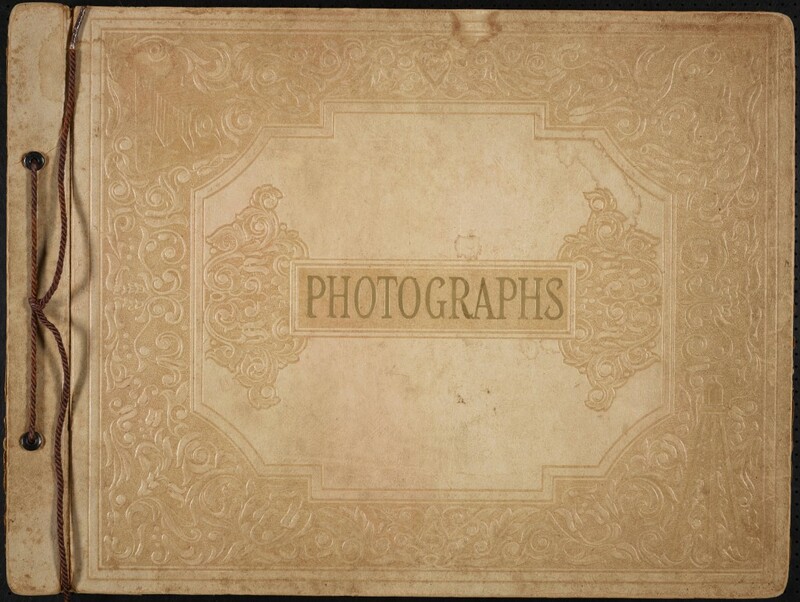 These materials were digitized as part of a 2014-2015 Library Services and Technology Act (LSTA) EZ Digitzation Grant, as distributed by the Institute of Museum and Library Services, administered by the State Library of North Carolina. We are very excited to share a new addition to the DigitalNC collections: video! Over the winter we began work on a new effort to digitize a selection of audiovisual materials from around the state. We gathered a wide variety of films, videotapes, and audio cassettes from some of our partner libraries and worked with a vendor to have everything digitized. The results are starting to come in, and they’re a lot of fun. In honor of National Library Week, and in special recognition of National Bookmobile Day, we are sharing our first film: a terrific recording of the Rockingham County bookmobile visiting a local school in 1939. The film enables us to take a glimpse into the past as we watch a pretty fancy looking bookmobile pull up to the school, some earnest and well-dressed librarians getting ready for the kids, and then we can see the excitement of the children as they browse and pick out books from the mobile shelves. And of course, there’s Jim the library dog, who liked to ride on the front seat and was a fixture at every bookmobile visit. The film is from the Rockingham County Public Library, which has also contributed a great selection of photographs of the bookmobile in action. Digitization was made possible by a grant from the Knight Foundation through the Digital Public Library of America. Look for more moving images and audio recordings coming to DigitalNC very soon. Academic bulletins and course catalogs from our partner Cleveland Community College have been added to DigitalNC. In addition to course listings, the student handbooks outline the history, courses of study, accreditations, and core policies of the institution. Cleveland Community College was originally established in 1965 as a unit of Gaston College under the name Cleveland County Indusrial and Adult Education Center. 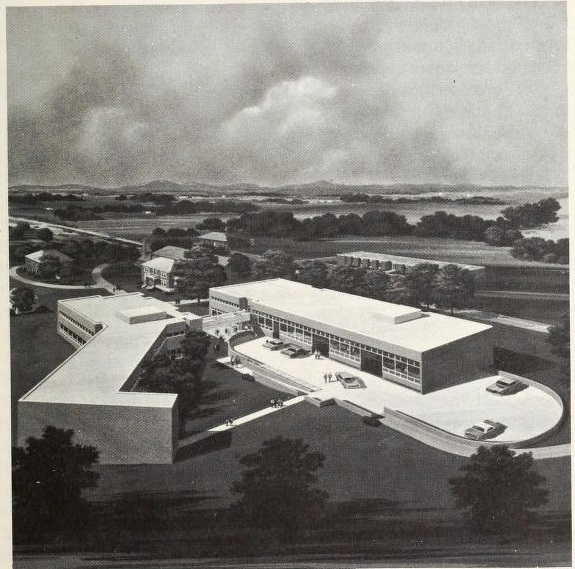 In 1967, it became a unit of the North Carolina Community Colleges and the name was changed to Cleveland County Technical Institute to reflect a new focus on technical education. In 1980, the institution was renamed again; it was known as Cleveland Technical College from 1980 to 1988 when its name was officially changed to its current form. 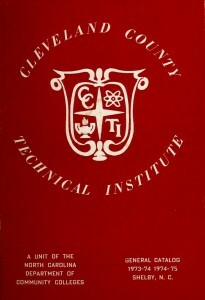 General catalogs, academic bulletins, and student handbooks from three incarnations of the institution–Cleveland County Technical Institute, Cleveland Technical College, and Cleveland Community College–can be found in this batch of campus publications; these publications range in date from 1973 to 2002. Additional student handbooks from 2003 to the present can be found on the Cleveland Community College website. 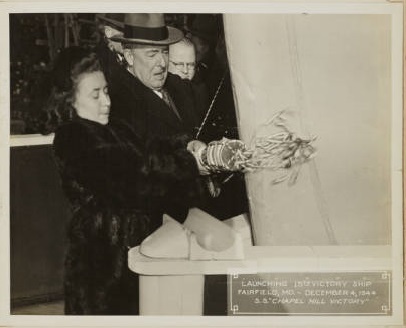 The Chapel Hill Historical Society has recently provided for digitization a photo album and the preserved champagne bottle from the christening of the S.S. Chapel Hill Victory in 1944. The photo album pictures the christening event and also provides information on the making of Victory and LST ships during World War II in the Bethlehem-Fairfield Shipyard in Baltimore, Maryland. 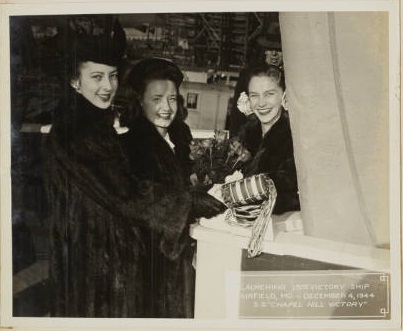 Betsy Bowman, pictured above and below, was the sponsor for the S.S. Chapel Hill Victory, and so she was invited to Baltimore to perform the christening on December 4, 1944. Before the christening took place, the sacrificial bottle of champagne was placed in a brightly colored bag so that no pieces of glass would be lost during the christening. The bottle was then smashed against the bow of the ship, and the S.S. Chapel Hill Victory was ready to be launched! 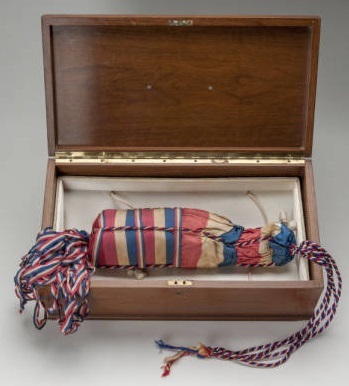 After the ceremony, the champagne-covered bag was allowed to dry, and is now in the care of the Chapel Hill Historical Society. In addition to this selection of yearbooks is a 1926 senior yearbook and scrapbook from Goldsboro High School called Just Seniors. The yearbook features portraits of the 66 seniors as well as mementos, newspaper clippings, postcards, pressed flowers, personal messages, and programs collected by the copy’s owner Louise Johnston Spoon. 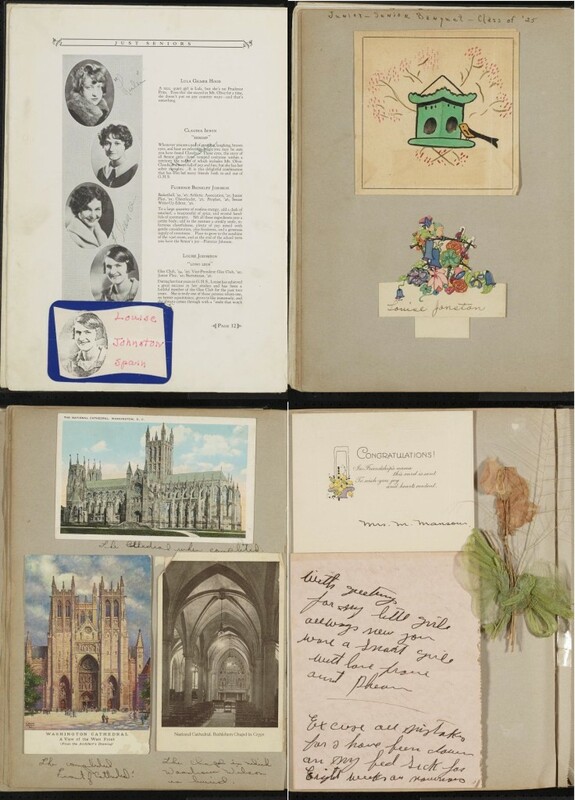 From left to right, clockwise: Louise Johnston Spoon’s yearbook photo, page 12; 1925 Junior-Senior Banquet Program, p. 47; Postcards, p. 58; pressed flower and personal notes, p. 106. To browse more yearbooks, click here. To explore more materials from Wayne County Public Library, click here. 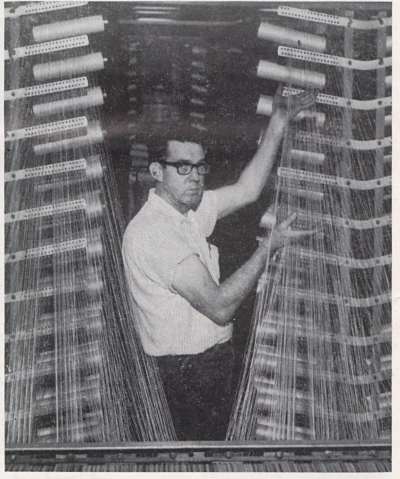 Coy Stiles, checking the warp at the Gastonia plant. 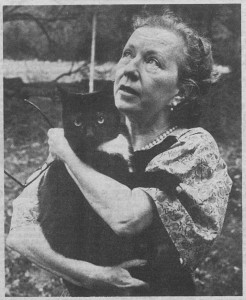 September 1972 issue, page 1. As mentioned in this earlier blog post, the paper includes news about employee accomplishments, updates in textile research, and information on plant safety and expansion. There’s an interesting mix of company updates and “human interest” stories, like A Father & Four Sons (September 1, 1972, p. 2) which includes a great picture of the Firestone employees in the Tom J. Neal family. While published for the Gastonia plant, some of these later issues of the Firestone News also report on events at Firestone plants in Bennetsville, SC; Bowling Green, KY; and Hopewell, VA.
You can view the all of the digitized issues of the Firestone News on DigitalNC here.